NEWAYGO, MI — Any differences were set aside when they stepped off the bus; those of the men who had gone to war and come back sullied; and those of the open-faced anglers who greeted them, hoping to thank them for their efforts. The bus had arrived from the Battle Creek VA Medical Center. Its passengers, mostly men, bore scars that lay hidden, the insidious effects of battles not forgotten. Their issues cut across ethnic lines and body types. Some were big men, some small; some hardened, some not. Some were lost, some found and every one was looking. Their hosts had arrived full of convivial good cheer, hauling drift boats and fishing rods. They were members of Trout Unlimited chapters, or professional guides with outfitters such as Baldwin Bait and Tackle and the Pere Marquette River Lodge. Each wanted to give back, to do what they could to help the veterans. “This is my way of saying thank you,” said Tim May, the retired school teacher from Battle Creek who organized the Project Healing Waters Fly Fishing float this day. May is a board member for the Kalamazoo Valley Trout Unlimited chapter. “I got involved because my father-in-law was a World War II POW. He was a pilot who got shot down. My son is a Marine who served in Iraq and Afghanistan. I have a brother-in-law who was in Vietnam. May first learned of Project Healing Waters a year ago on an outdoor television show. He got hooked on the idea, then involved with the non-profit organization that grew out of a program started in 2005 at Walter Reed Army Medical Center. Today, Project Healing Waters is offered by Trout Unlimited and Federation of Fly Fishers chapters in 41 states. “They are good people,” said David Cooley, a Vietnam veteran who participated on the Muskegon River float. He had attended the fly-tying classes leading up to the outing. Having fun and relaxing is what the program is about, according to Gary Decker, one of two VA therapists who participated in the outing. Any good day is another step forward for the men, many of whom are dealing with post traumatic stress disorders. Cindy Cooley, David Cooley’s wife, will vouch for that. She said being around water helps calm her husband. He has difficulty being alone. She feels the pressure of his need. That heavy curtain was perhaps lifted for a short while this day as the men floated down the Muskegon River. The vets and their guides were heard laughing on more than one occasion as the flotilla spread out. 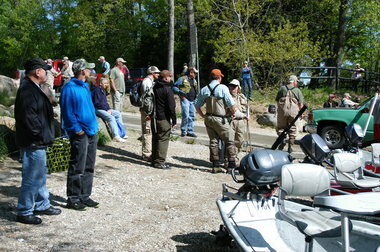 The anglers all got a chance to learn, to enjoy the sunshine, the fishing and box lunches. The float took four hours and many caught fish. And though it was to be a fly fishing event, spinners often proved more productive. “This is just the right thing to do,” said David Smith, the state chairman for Michigan Trout Unlimited. It was his first exposure to the Healing Waters program. Smith managed to avoid getting skunked in the last minutes of the day. 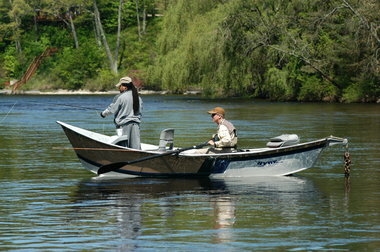 But it took turning to his secret weapon: a small spinning rod he had tucked away in a hold on his drift boat. Smith’s trout came in on a No. 1 yellow and orange Mepps spinner. His Adams fly saw little action. Carl Vinegar, a vet from Pontiac, spent the afternoon developing his fly-fishing skills. He smiled broadly and said he “had a good day.” Vinegar spent the afternoon floating with Eric Johnson, from Holland, a member of the Schrems West Michigan Trout Unlimited chapter. Each man, of course, had his story. Sharalyn Davis, another VA therapist on the Healing Waters float, said experiences like this day help the Vets get on with their lives. “These guys are curious about so many things, but never get out and try them. Many are dealing with stress or are in substance abuse programs. In that there were few differences between the men at all. This entry was posted in Uncategorized and tagged Fishing, Fly Fishing, Muskegon River, Project Healing Waters, Trout, Trout Unlimited. Bookmark the permalink. Great article! Thanks for writing it. Communities need more things like this to embrace returning veterans.